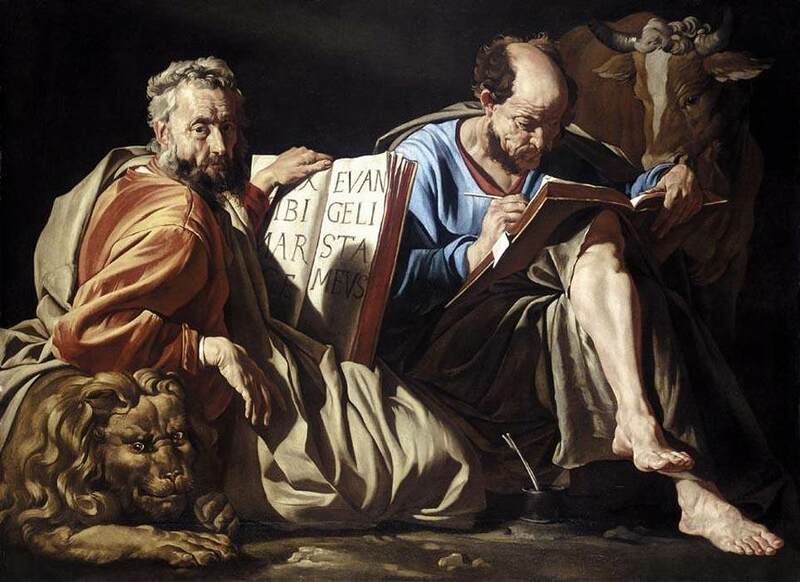 Mattihas Stom’s depiction of Mark (distracted and looking at us – he probably already finished his 16 chapter cliff notes version on Jesus’ life) and Luke (still hard at work with his research). With this in mind, since I myself have carefully investigated everything from the beginning, I too decided to write an orderly account for you, most excellent Theophilus…. I then opened to the Luke’s biography of Jesus to start on this morning’s chapter and read Luke’s introduction to Theophilus, the person to whom Luke addressed his account of Jesus’ life. Having just been thinking about what your writing reveals about the person, I realized how much Dr. Luke [traditional holds that he was a physician] revealed about himself in his introduction. He is methodical, making sure that his “orderly” account was properly introduced. There’s a formality to Luke’s style and structure. He notes that his account is the result of “careful investigation,” and I could imagine the brain of a scientist at work. He had researched everything “from the beginning.” The good doctor was thorough as well as methodical. As I’ve poured over the “big four” biographies of Jesus countless times, I’ve come to appreciate particular things that are unique to each. The thing that I quickly observed in reading Dr. Luke’s investigative report, and which I have come to greatly appreciate over the years, is that it contains small details and entire episodes in the story of the life of Jesus that aren’t found in the accounts of Matthew, Mark, and John. A physician diagnosing the events he’d witnessed, you can feel Luke’s brain systematically questioning, researching, cataloging, and filing all of the facts so as to lay them out to Theophilus in the most clear and logical manner. These details and episodes provide incredible color and context to the story. This morning, I am thankful for context and color. I’m thankful for diverse peoples and personalities whom God created to bring that color and context to both His-story and to each of our own stories. I’m thankful for Dr. Luke, whose physician’s brain does not work like mine (I think I’m more like John), and his meticulous investigation which I have enjoyed and from which I have greatly benefitted. I just thought – if you ran for president, I’d probably have a lot of people digging into my background and my life too. Not that I’m hiding anything, but don’t, okay? You got it – as long as the agreement works BOTH ways!